What if it were possible that your most cherished memories were lies... and that finding out the truth could cost you your life? Richard Kilmer is head over heels in love with Jennifer Ryan, who takes him home to meet her parents, where she accepts his marriage proposal. While visiting, they set out on a nostalgic drive up to Kendrick Falls. On their way, a freak storm rolls in, Richard loses control of his car, and it rolls. When the storm clears in a matter of seconds, Jen is gone. Richard can't find her, and neither can the police who respond to the scene. More horrifying is that no one in Richard's life will even confirm Jen's existence, and all traces of her have disappeared. Where could she be? Has Richard lost his mind, or has something far worse happened? On Borrowed Time is a stunning new thriller about an ordinary man who is trapped in a nightmare where he can't be certain of anything--not even his own memories. A bit of a departure for Rosenfelt. I'm so used to the Andy Carpenter/Grover Gardner combo that this came as a bit of a surprise, but it was a good read. The premise was fascinating, and despite an inevitable disappointment in its resolution, I was very keen to see it through. And I didn't guess the twist, even though I was looking out for it. Nice work by the narrator, Chris Ensweiler. Seamless and unnoticeable like all good narration. On Borrowed Time started slow and confusiing and then kicked into high gear and finished strong. It certainly kept me guessing. I wonder if we will see this cast of characters in the future.. I liked the line "I could eat the air"
What did you like best about On Borrowed Time? What did you like least? I liked the somewhat different plot line. I didn't like that much of the story line was, to me, not plausible. I kept thinking, is this guy really that stupid? 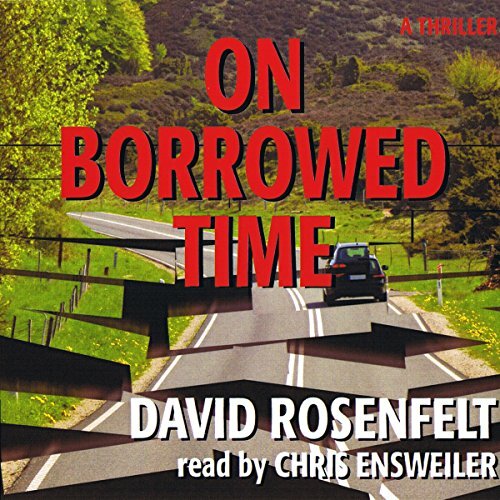 If you’ve listened to books by David Rosenfelt before, how does this one compare? Not on a par with the writing nor the narration of the Tara series, but a decent attempt at a different style for Rosenfelt. What three words best describe Chris Ensweiler’s performance? Yes. I think a movie producer could fix the broken parts. I love conspiracy theories, but I don't care much for stupid main characters. The lead character fell for too many outrageous coincidences, and brother, is he naive when it comes to women. I won't include any spoilers, but you will be shaking your head at some of the things he falls for in this book. The narrator is trying hard but his voices are very lacking, especially his bad guys who all sound phony. There was one point where he did a good job so that I recognized a particular bad guy when he spoke from behind. I think he will improve as he goes along in his career. As for the writing, it was a decent attempt at a thriller but not up to the par of the Tara series with their wry humor and interesting characters. But, hey, I'm picky. Would you listen to On Borrowed Time again? Why? I would indeed. This was a unique book in several ways. The book held my interest and gave me several hours of pure listening pleasure. I re-read books I enjoy quite often. This will be one of the ones I listen to again. Which character – as performed by Chris Ensweiler – was your favorite? A very different plot here...unique...fresh! The storyline absolutely held you in its grip all the way through. I have read practically everything that David Rosenfelt has written. All Andy Carpenter books get an automatic five stars! But this was no Andy Carpenter. I would have given it a 3 1/2 rating if there was such a thing. I felt the plot was just a bit too far out to be believable. I will continue to be a Rosenfelt fan, but this departure from the Andy Carpenter series did not really thrill me. It was okay. Just ok. To start with the whole "event" was too preposterous. So nothing was really believable. Narration was okay. By the end I got so bored I couldn't keep track of the twists and turns. What a disappointment. We were on a trip and wondered where we and the book were headed! Excellent, gripping thriller, well read, that carried me along the entire time with the intensity of the story. The best of Rosenfelt's novels & I've listened to them all! What would have made On Borrowed Time better? I agree with Karen -- the book went on forever and ever and ever.... agonizing details, etc.... great narrator, just could not get into the premise.